I grew up in New York City. My back yard was the hard gray pavement. Most of my childhood games were played on the sidewalk, games such as hopscotch, jump rope and stick ball. Every summer though my family would go on vacation and we would spend two glorious weeks away from the city. We would drive up to the Adirondack Mountains and stay at a cabin on Loon Lake. Much like Dorothy, my world went from Black and White to Technicolor. The cabin was in a wooded area just a short walk from the lake. The surrounding woods were filled with little paths to other cabins. Every afternoon I would take a long walks along the paths. The woods were filled with blackberries, raspberries and blueberries. I would fill my pail each afternoon and return to the cabin. Many days I would return from my walk and my sisters and I would just eat the berries straight from the pail, too impatient to make them into a dessert. But on those few days that we controlled our impulses to eat those berries immediately we would stand at mom’s side and make a dessert. We kept our desserts pretty simple: pies, cobblers and crisps. 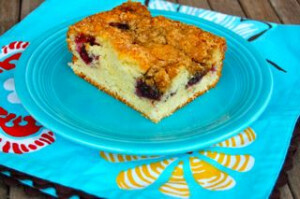 The blackberries almost never lasted until the morning so I bought enough recently so that I could make this delicious coffee cake, it’s moist and slightly sweet bursting with blackberries. Even better is how easy it is to make. 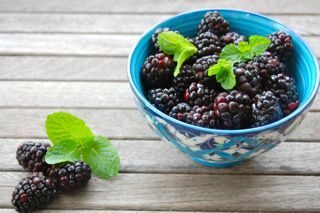 Picking and cooking with blackberries were some of the happiest and most delicious moments of my life. From by the bay wishing you delicious blackberry memories! Preheat oven to 375 degrees F. Grease a non stick 8″ square baking pan and cover bottom with a square piece of parchment paper. In a small bowl add the flour, baking powder and salt and mix. In a medium size bowl add the oil, sugar and egg. Beat using a spoon until well combined. Slowly add the flour and buttermilk alternately, blending well after each addition. Turn batter into the greased pan. Top with the blackberries. In another bowl add the ingredients for the crumb topping and mix well using your fingers until butter is incorporated and texture is crumbly like sand. Sprinkle evenly on top of the batter. Place pan on a baking sheet and bake for 40 to 45 minutes, until a tester comes out clean. When cake comes out of the oven let cool 5 minutes and then loosen the sides with a knife . Let cool another 5 minutes and turn onto a wire rack. Remove the parchment paper and let cool another 10 minutes. Place on a serving plate . This is great to serve warm or at room temperature. This entry was posted in cakes, desserts and tagged baking, blackberry recipes, buttermilk recipes, coffee cake recipes on May 24, 2014 by entertainingbythebay.